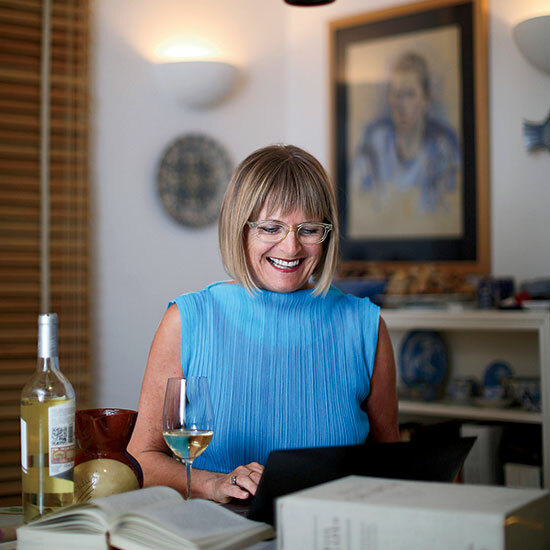 Reigning British critic Jancis Robinson, a wine adviser to the Queen, has influenced world opinion for almost 40 years. Here, she talks about the past, the future and the surprising health of her hardworking liver. Q. You’ve mentioned that a glass of 1959 Chambolle-Musigny “lit the flame” for you in terms of wine. When did you have it? A. It was when I was reading Maths and Philosophy at Oxford. I had a boyfriend whose father gave him a very generous allowance, some of which was spent on taking me out to eat. We shared this seminal bottle of Burgundy at a restaurant called Rose Revived, which still exists. Q. You’ve had a long career. What have been some of the most significant changes in wine since you started in the mid-1970s? A. Are you calling me a dinosaur?! If I tell you that when I started writing about wine, everyone was mad for white in general, especially a rare grape variety called Chardonnay, you will get some idea of how long I have been in this business. The red wine boom is an obvious change of direction from the mid-’70s, as is the trend I am now witnessing in most of the wine world, where both producers and consumers are tiring of very concentrated, alcoholic wines and are looking for more freshness and wines that are shaped more by the vineyard than by what happened in the winery. I’ve seen people fall in and then out of love with oak. Another very significant change has been the shift in interest away from a handful of international grape varieties toward indigenous varieties—great for biodiversity. Then there are the very noticeable effects of climate change, and the increased awareness of the importance of sustainability. Q. Looking to the future, are there any regions that haven’t quite gotten their act together yet that you see as potentially exciting? A. I’d bet that Mexican wine will be much better known in 10 years, and also the wines of Cyprus and Crete. And, of course, China will be making decent and much more varied stuff. Q. China’s predicted to become the world’s biggest producer of wine grapes in a few years. Will that affect wine in the UK or the US? A. I suspect most Chinese wine will stay in China—after all, there are millions of consumers who haven’t ever tasted wine, and yet wine has a more glamorous image there than in practically any other nation. Compare and contrast that with how the average French person views wine: as an old man’s drink. Q. And what about the whole natural-wine movement: Is it a good thing or a bad thing? A. Is there even a short answer to that question? I’m relaxed about it, but save me from zealots—especially Parisian sommelier zealots. Q. Do you think there are under-$20 wines that can age well in a cellar? A. I’d say a few red Côtes du Rhônes and some Spanish old-vine Garnachas. And, of course, some of the world’s cheaper Rieslings—the odd dry one from Clare Valley in Australia, and some from Germany’s under-celebrated producers. Q. Your husband, Nick Lander, is the restaurant critic for the Financial Times. What did you drink on your first date? A. Our first date was in 1980, when he was importing some not-very-good California wines into the UK. I can’t remember what we drank or who chose it. I was much more interested in him than in the wine list. Q. I’ve heard you have a secret way to deal with the risks of drinking too much wine. A. Yes, milk thistle. It’s a plant extract that is supposed to help your liver process toxins, and it’s been part of my life for many years. My co-author of Wine Grapes, Dr. José Vouillamoz, specializes in medicinal plants in his day job, and he recently attended a conference by a world expert on the topic. Professor Hostettmann from the University of Geneva said that milk thistle was the best liver-protecting—or liver-boosting—plant available, and that he takes it himself before serious dinners. I had an ultrasound the other day and asked particularly about the state of my liver. I was told it was in great shape! Nick found this hard to believe.